Is it okay to talk to the police after a car accident? 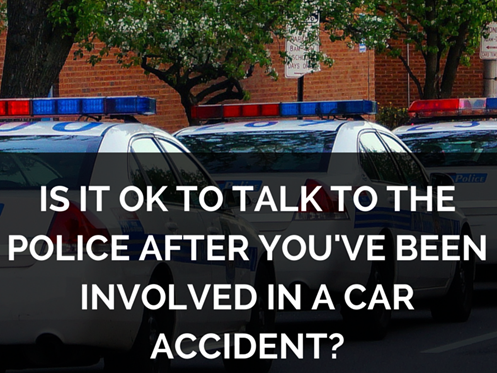 Answer: Can you talk to the police after an accident? Should you? What do you tell them? Ok, let's be clear on this. When an accident occurs, you should ALWAYS cooperate with the police. You should answer their questions, you should provide them your information and you should tell them your version of the accident. Be honest about the facts and be honest about your injuries. The police are there to assist, and generally, not to "judge". They are there to investigate and record the facts at the scene and related to them by parties and witnesses. If involved in an accident, I am not sure why anyone would refuse to talk to or cooperate with the police. Especially if you did nothing wrong, you want the police to understand all of the accident facts. On this same note, if you are the one to call the police, you should be ready to tell them everything that occurred. A police officer at an accident scene will prepare a report based upon the investigation. Your conversation with the officer will form the basis for his report and conclusions. It is important that you speak with the officer to make sure that your version of the accident is communicated. Otherwise, if the officer only hears the other side's story, you may not like the conclusions drawn. As a phoenix car accident lawyer, I've seen examples of this time and time again. Make sure you protect your rights.